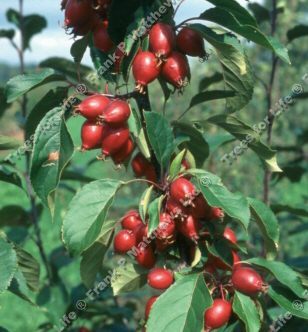 Red Obelisk (Malus 'Red Obelisk') was first introduced in Belgium. A nice, compact upright tree with pink buds opening white and followed by attractive, conical, red fruits. Foliage is purplish-brown at first, later becoming dark green. Red Obelisk apples are good for crab apple jelly. This tree is supplied at a height of between 1.2 and 2.4 metres in a 5-12 litre container for year round planting and better results than from either bare-root or rootballed stock. We deliberately use the vague description of around "x" amount of years old because freak weather can severely affect growth rates.